Hudson Street Press, 9781594630835, 257pp. Fear can't help you in a dangerous situation. A former FBI profiler shows you what can. 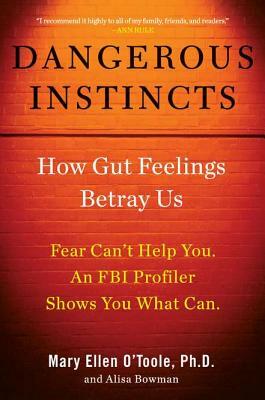 As one of the world's top experts on psychopathy and criminal behavior, Mary Ellen O'Toole has seen repeatedly how relying on the sense of fear alone often fails to protect us from danger. Whether you are opening the door to a stranger or meeting a date you connected with online, you need to know how to protect yourself from harm-physical, financial, legal, and professional. An especially useful book for women living alone, parents who are concerned about their children's safety, and employers worried about employees who might go postal, Dangerous Instincts gives us the tools used by professionals to navigate potentially hazardous waters. Like "The Gift of Fear" and "The Sociopath Next Door," it will appeal to anyone looking to make the right call in an ever threatening world. Mary Ellen O'Toole, PhD, retired from the FBI in 2009. She lectures at the Smithsonian, and frequently speaks all over the world. Alisa Bowman is the coauthor of six "New York Times" best- sellers.